I've really enjoyed falling back into my reading habit and I'm excited to see how well it's melded back into my life. I did stay up later than I should have a handful of times (oops), but mostly I have been able to stay productive with other things AND have the benefit of mind expanding facts, new points of view, and fantastical worlds. 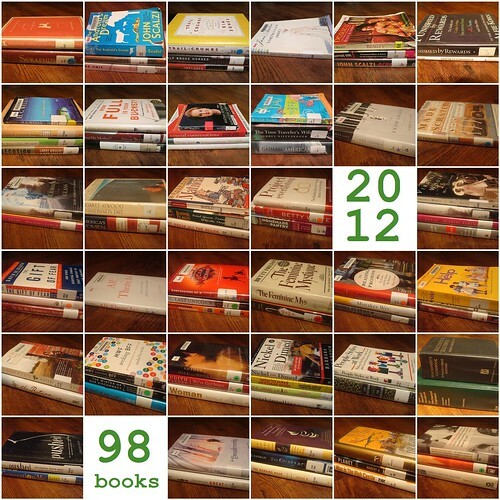 For 2013, I've set my goal as 75 books. I'm not sure that I will have quite the momentum that I had early last year, but 75 should still be doable! You'll see I have my new goal tracker installed on the left sidebar, all shiny and ready to go! On a related bookish note, the hubby surprised me with a Kindle Fire HD for Christmas and I'm in nerdy, booky nirvana! As soon as I get a routine worked out for getting e-books I will be well on my way. Any tips and traps? Go you! I barely made my 52 book goal for this year (squeaking out 53 tomes), but I did do a prodigious amount of crafting. Not sure if I need to read more or craft less!